Omigosh look! I think the “font” on the box is actually the deck creator’s own handwriting. That is so cool! The perspectives in some of the Keys are so creative, like the bird’s eye view of The Chariot from above. If you want, you can even write in keywords at the top of each card. That’s the other great feature about this deck– it seems to be fully customizable. You can color it in, for instance. They’re kind of perfect for coloring in actually, and then using color symbolism in the way you read this deck. You could work with colored pencil and then apply a fixative spray to set a finish over your coloring, which will protect it and keep it durable. Superfine tip permanent markers is another option. You could also customize these cards with your own detailing– add to the background of the cards, fill in the scenery, draw the bricks on that Tower card, add imagery to the foreground of The Star card, etc., and really transform the Black Tarot into your own unique deck. Add the astrological correspondences in a decorative, ornamental way and work with the deck in operations such as the Opening of the Key. The Minors have been renamed. Here, the Spheres correspond with the suit of Wands, for fire, logic, and origins. I confess this initially confused me a bit, as I had made the presumption this was the suit of Pentacles/Disks. I love the wabi-sabi aesthetic here in the Black Tarot. Wabi-sabi is a Japanese aesthetic perspective rooted in changing lines (symbolic of impermanence or transience) and finding harmony in the world’s imperfections. It’s usually characterized by asymmetry and a lot of white space. I see a subliminal homage to that style here in the Black Tarot‘s art style. The suit of Snakes corresponds with Pentacles and the element earth. Snakes symbolize ethics, materiality, and nature. It’s interesting to see how deck creators bring their own perspectives to tarot art and then how differing cultures of those working the decks can change the meanings. The suit of Keys corresponds with Swords, the element air, epistemology, intellect, and the tools we create to help us advance in our missions. 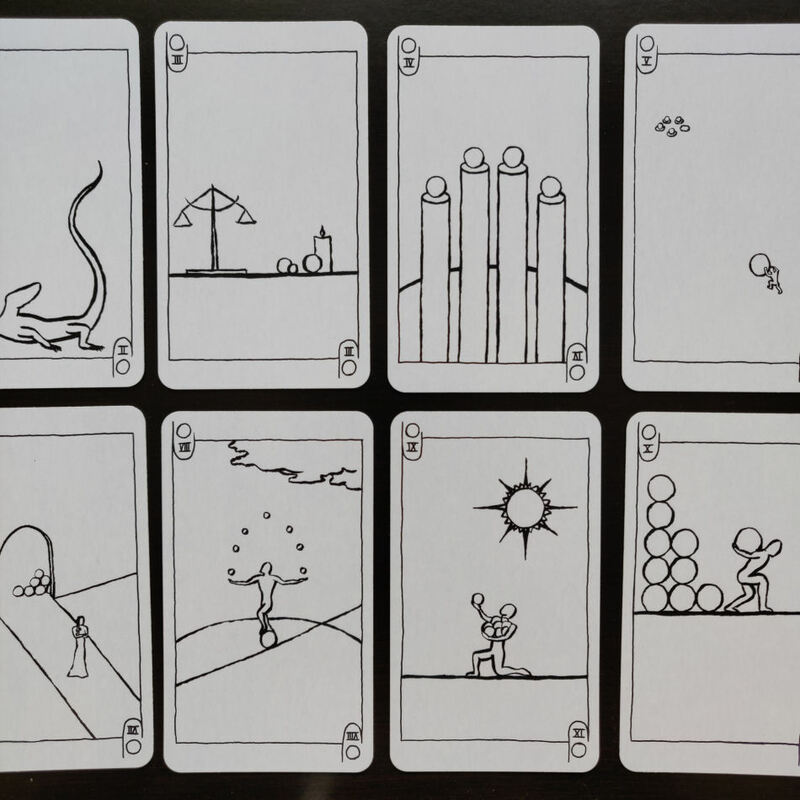 The deck creator interprets the card meanings in unique ways and yet does such a clever job depicting the story of each card with only a few simple lines. It’s quite amazing actually. Finally, the suit of Stars corresponds with Cups, or the suit of emotions, the element water, metaphysics, and congruity. I kind of dig that the Stars are subbed in for Cups and corresponds with Water! What I really love the most about this deck is how it gives so much space for personal customization. You don’t even have to work with it as a tarot deck. Take time pathworking or meditating on each and every single card and arrive at a keyword for yourself. Add the keyword to the top margin of the card. Add color, detailing, and whatever moves you to the basic imagery and transform this into an oracle deck. With so much of your personal energy infused into it, such an oracle deck would be a powerful divination tool to work with. 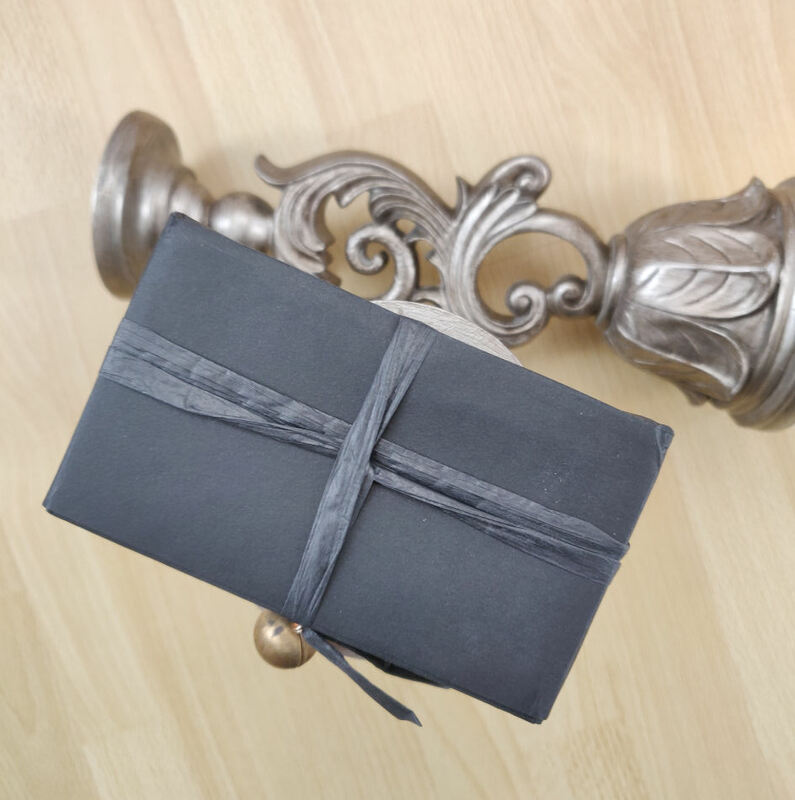 In terms of packaging, the deck came beautifully wrapped in black paper and black ribbon. The edges are lined a matte silver finish and cardstock quality runs standard– easy to shuffle with, bendable, yet sturdy. By the way, I looked for the byline and deck creator name, but just couldn’t find it anywhere– the creator of this deck has opted not to display or at least not prominently display authorship anywhere. If you’d like to order a copy of the Black Tarot, go to the creator’s website and send a message. When the decks are available for sale, the creator will contact you. I love the minimalism of this deck and how the scarcity of lines in effect frees your intuition. 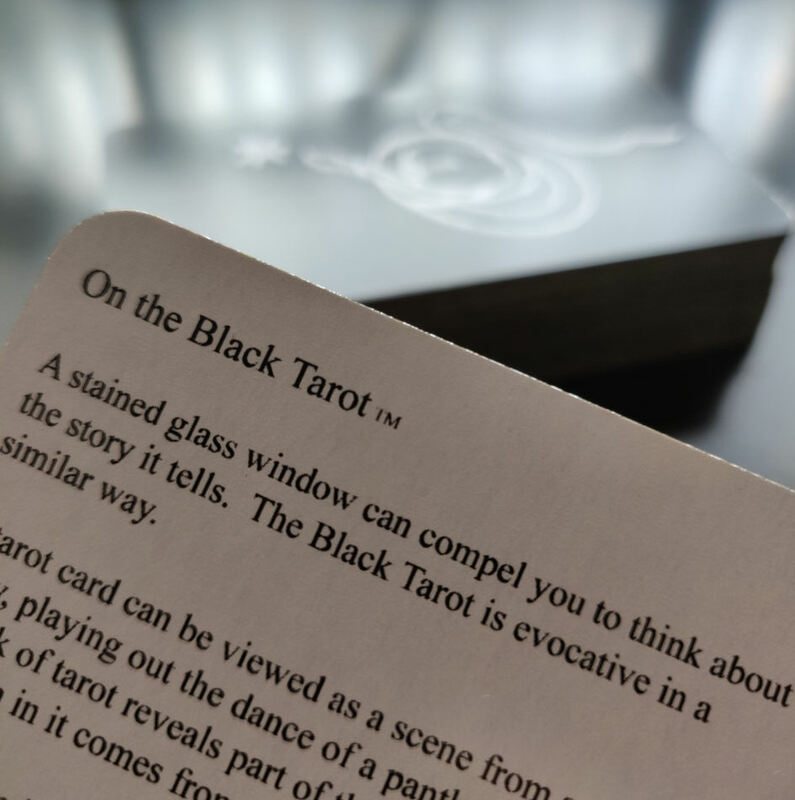 The Black Tarot is a reductive reinterpretation of the tarot deck. 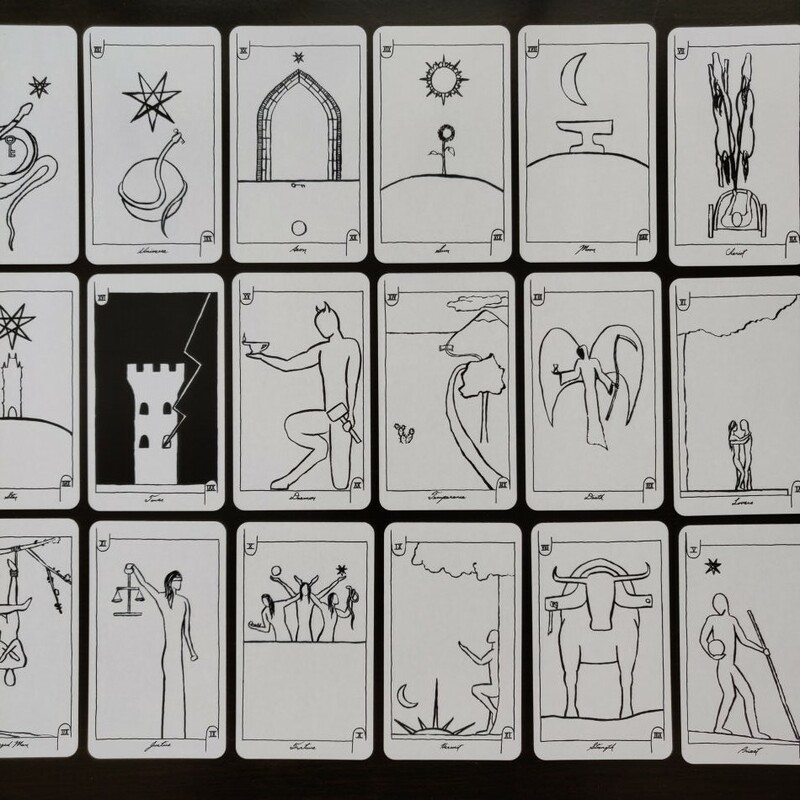 The basic line drawings return to a theoretical common denominator within the tarot system. In your hands, you can then choose to either work with that common denominator as-is or develop it and add your own take. In the chaos we live in today, a minimalist deck like Black is highly welcomed. Black achieves a Zen aesthetic that can facilitate meditative states, inner calm, and clear wide open the exploration of your own inner landscapes of imagination. Personally, I’ll want to then infuse this deck with what I see in the landscapes of my own imagination. When I get a block of leisure time to myself, I plan on revisiting my copy of this deck, channeling keywords for each card, writing those keywords up at the top, adding the astrological correspondences, and maybe even going in with a black pen to add a few lines of my own art to blend with what’s there. Then work with such a deck in a way that’s kind of a fusion-combination of tarot and oracle. 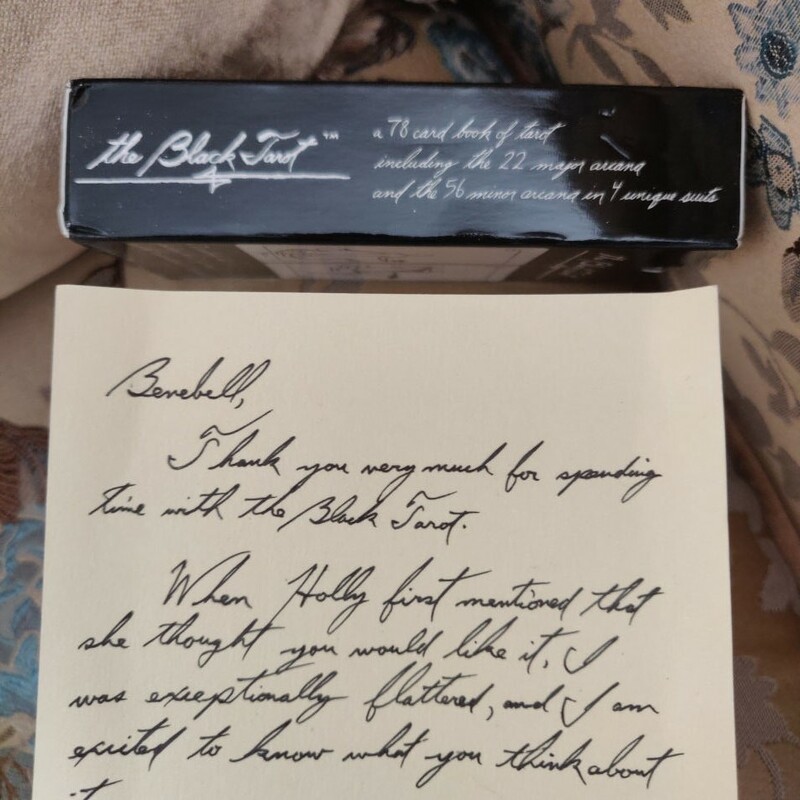 FTC Disclosure: In accordance with Title 16 of the U.S. Code of Federal Regulations Part 255, “Guides Concerning Use of Endorsements and Testimonials in Advertising,” I received The Black Tarot from the deck creator for prospective review. Everything I’ve said here is sincere and accurately reflects my opinion of the deck. Initially, I admit to a lackluster response to this deck. However, due to your evocative review… I am heartily considering ordering this deck.